"Out of the smoke and haze, a sword-wielding Confederate colonel riding a horse swiftly bore down on [the twelve year-old]." "'SURRENDER, YOU DAMN LITTLE YANKEE', the colonel yelled." "Johnny raised the heavy weapon and fired. The bullet toppled the Confederate colonel from his horse." 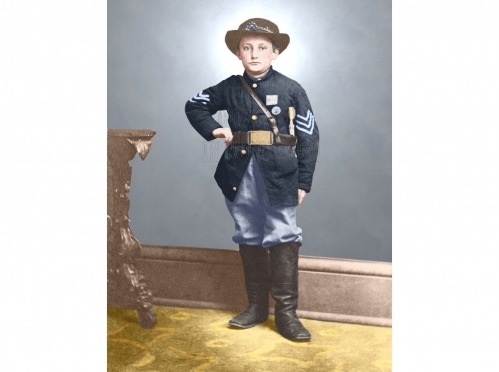 "Later, Clem met Lieutenant General Ulysses S. Grant..."
Click here to read about the boys who fought for the Confederacy.